(Lake Forest, CA) July 28, 2011 – Today Del Taco is adding two new burritos to its popular menu with the introduction of the 59¢ Chipotle Value Bean & Cheese Burrito and the Nacho Crunch Burrito. Both burritos reinforce the chain’s reputation as the go-to place for the best tasting burritos at a great price. 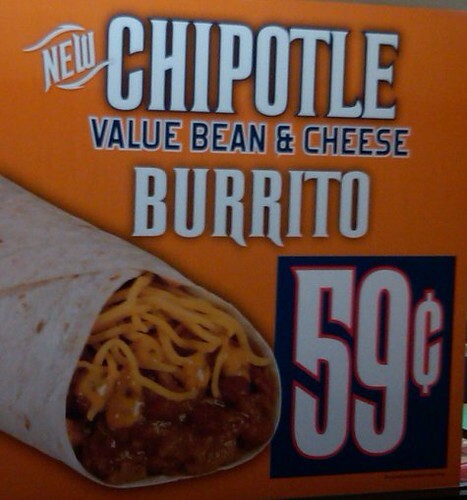 The 59¢ Chipotle Value Bean & Cheese Burrito delivers the smoked chili pepper flavor distinctive to chipotle and includes slow cooked beans made from scratch, freshly grated cheddar cheese and Del Taco’s new, creamy chipotle sauce all wrapped in a warm flour tortilla. 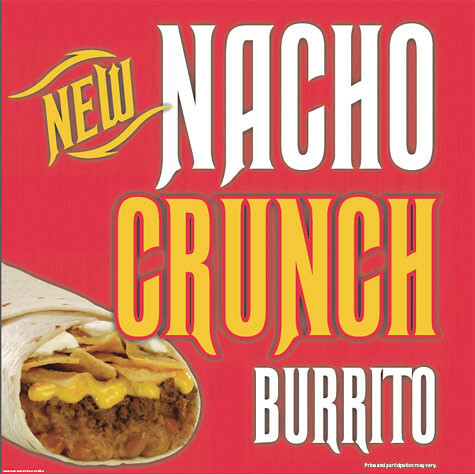 The Nacho Crunch Burrito is made with seasoned beef, slow-cooked beans, nacho cheese sauce, sour cream and tortilla chips wrapped in a warm flour tortilla. Del Taco is also offering a Nacho Crunch Burrito Meal for $5 that includes the new burrito, two regular tacos, small fries and a small drink. Del Taco’s Facebook fans can download a coupon on the “Free Food Coupons” tab at http://www.facebook.com/deltaco for a free Nacho Crunch Burrito with any purchase at participating locations. 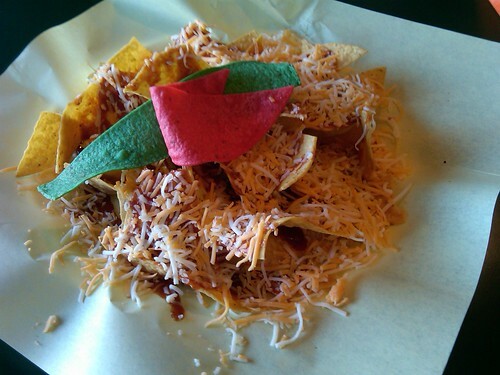 There's a restaurant that opened recently in Tustin that for a time was going to be called Pablo McGinty's, a sort of Irish/Mexican fusion place (it ended up being called Pablo's Cantina and we will have a review of them) which seemed like a unique idea but it had actually been done before. 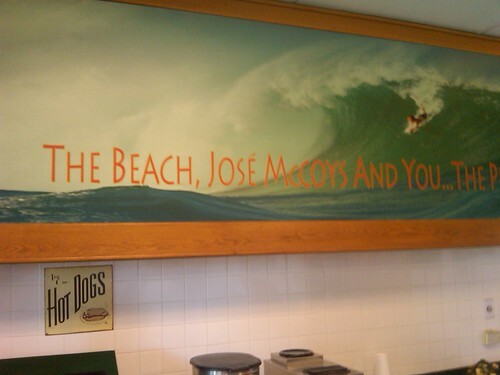 The place was called Jose McCoy's and the one I remember going to was in Seacliff Village in Huntington Beach. Oddly enough, I went with a friend who was of Irish/Mexican heritage. The first time I went was as a teenager and this friend's mom took us there because she loved the seasoning they used on the fries. I went a few more times and then I don't think it lasted there much longer but moved to near Warner and Bolsa Chica and then that location closed down a couple years ago. I then asked the owner, Sammy, if any items were held over from when it had been Jose McCoy's and he mentioned the strips and cheese as the only item. 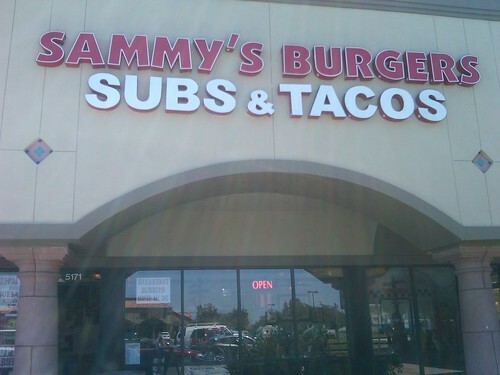 I also found out during this visit that this was also Sammy's second location and it came back to me that I had gone to his prior one at Beach and Talbert in the 1980s. Then I found out while typing this up and doing further research that Jeff Overley had written up the strips and cheese before at the Orange County Register's Food Frenzy blog. 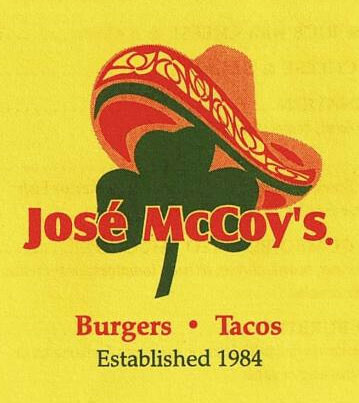 Does anyone else remember Jose McCoy's and the seasoning on their fries and the strips and cheese? Of course the other place to get strips at cheese at is at Zack's at the Beach. Coming up next week is Munchathon, "A unique festival that combines a 5K-obstacle course with a food truck festival featuring your favorite food truck in OC & LA, entertainment and more!" It's like a way to work off calories as you eat. ORANGE COUNTY, Calif. – The first-ever Munchathon, featuring a 5K fun run and obstacle course with food/beverage stops and a festival of munchies has announced a few of the food and beverage sponsors to be part of the race PLUS new gourmet food trucks added to the lineup! From their sweet tasting juices like strawberry banana, guava, banana blueberry and many other fruitful flavors, Kern’s Nectar also offers iced tea (mango, lemon, raspberry) horchata and aguas frescas (in Limon, Tamarindo, Jamaica). 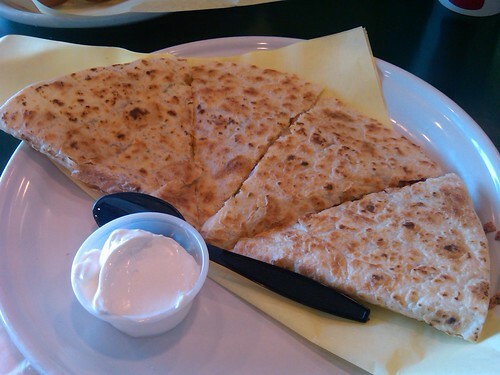 Get ready to whet your palate with something so flavorful after munching on delicious eats! The ever-so-delicious soy milk comes in sweet flavors vanilla, chocolate and original. Get ready to quench your thirst with this superb drink. Might go well with a chunky chocolate chip cookie (*wink*). Oh, do we have something sweeter than ever planned for all you Munchathon race participants! The scrumptious delicacies of Meringue Bake Shop of North OC will be one of the food stops on the 5K course. Known for their Push Cakes, Whoopie Pies, Cookies & Cream Brownies and exquisite cupcakes, Meringue will be offering a taste of what’s cook’n in their kitchen and after the race, they will be selling all sorts of delicious goodies. Welcome the soon-to-launch and cart newbie Front Porch Pops to the Munchathon course! Chill out with samples of artisans popsicles in mouth-watering flavors like Syrah Poached Pear, Strawberry Rhubarb, Creamy Lemon Buttermilk, Mango Lassi, Blueberry Lime and many more. And after the race, Front Porch Pops will have items for sale at the festival portion of the event. *MORE food sponsors to be announced soon! And more announcements daily on munchathon.com! Also, ticket giveaways for the run and festival have begun on the Munchathon Facebook and Twitter pages. Registration (includes festival admission) now through 6/30 for runners is $49 and for a team is $189. General Admission Tickets are $12 and Early Admission Festival Tickets (10 a.m. entry time) are $22. Children ages 6 and under are free. Register for the Race HERE! or Buy Festival tickets HERE! Do you have questions for us? Well, check out our FAQ. Eat your way through the first-ever Munchathon, a food-themed fun run and obstacle course featuring local food and beverage vendors, which takes place at Oak Canyon Park, near Irvine Lake, on July 16. The event will have two major elements: the 5K run/walk with food/beverage stops and food-themed challenges, and a festival of dozens of gourmet food trucks. This event was designed for those of you who love food, follow more gourmet food trucks than actual people on Twitter, dash to your favorite restaurant despite your non-existent lunch break, devour whatever might be in arms reach at that very moment and consider yourself the ultimate foodie. Run, walk, skip and munch your way through the scenic course overlooking Irvine Lake. You will encounter obstacles and have several stops where you will have the opportunity to eat sample-size food items from gourmet food trucks and other vendors. You can also expect beverage stops along the course as well. Get a team together or go solo, dress up as bananas or hot dogs or piggies--whatever gets you pumped--and bring your appetite. After the run, participants will have access to a festival of gourmet food trucks, beverages, entertainment, vendors and lots more. Only the ones with the strongest appetites will survive. Munchathon is open to all ages. The 5K fun run goes from 9 a.m. to 11 a.m. Early admission to the festival is from 10 a.m. to 11 a.m. and general admission starts at 11 a.m. The event ends at 5 p.m.
To register for the 5K fun run/obstacle course (which allows access to the festival portion of the event) or to purchase tickets for the festival, go to munchathon.com.